Well, deck the halls with boughs of holly . 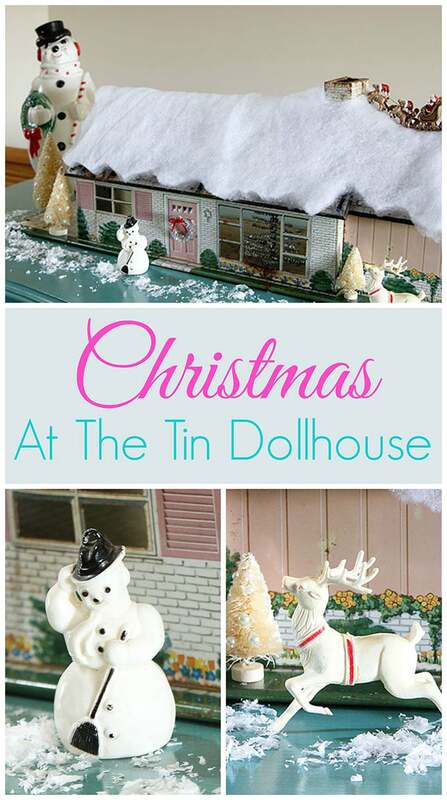 . . it’s Christmas at the tin dollhouse! Is it bad that I stole the bird’s home and made it into a Christmas decoration? I won’t get in trouble with Santa for that, will I? But since the birds weren’t overly impressed with my dollhouse turned birdhouse in the 1st place, I kicked out the ungrateful birds (don’t get your tinsel in a tangle, that’s a joke, no birdies were harmed), brought the house inside and started decorating it for the holidays. I actually think I’ve played with this tin dollhouse more than the one I got as a kid. A little snow here (just in case you were wondering, it’s fake snow). A few bottle brush trees there. A little Santa action on the roof. 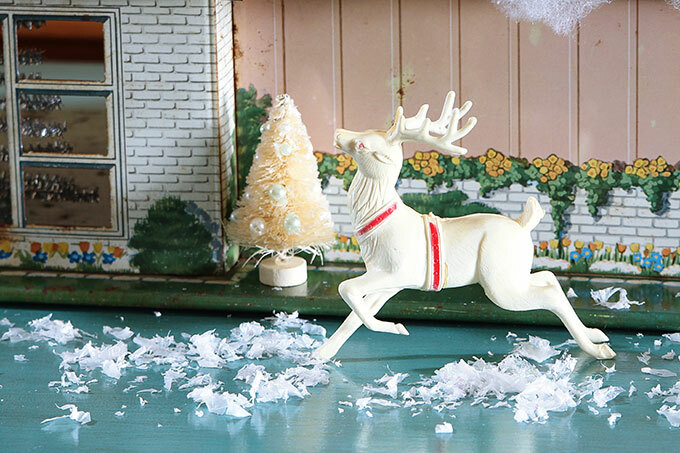 And a few vintage ornaments turned kitschy lawn decor. Even a tiny little mid-century modern silver tree for the living room. One of my readers, Ann (Hey, Ann! 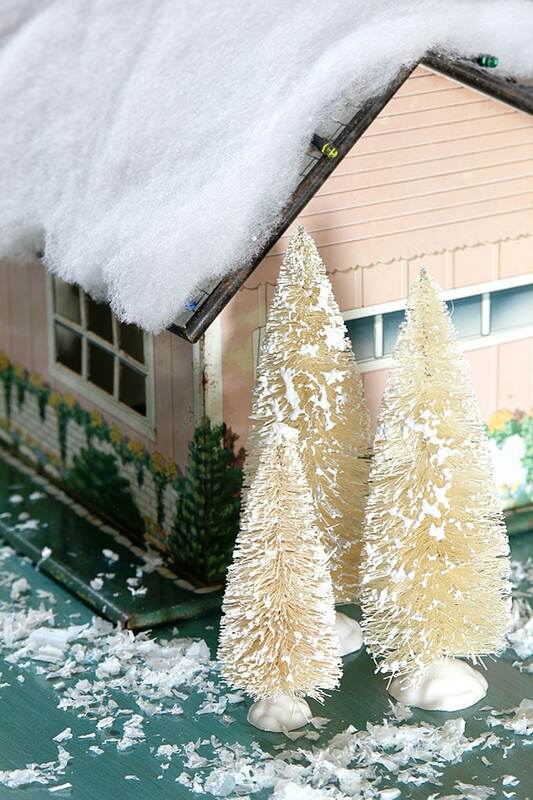 ), told me about a video Kate from Retro Renovation did on making a mini tinsel tree. It was perfect for my picture window, because if you have a picture window you just HAVE to have a tree in it. While you’re at it you can see how Kate makes a vintage ornament wreath also. I need to make one of those this year. Let’s not look too far inside the dollhouse though. The previous renters had to move out quickly and they took all the furniture with them. I’m thinking of filing a complaint against them, but then again they’ve probably flown off to Florida by now. Oh, and I almost forgot to show you the coolest part!!! I climbed up on my little ladder and strung Christmas lights on the roof!!! It’s a battery operated set I bought at Walmart and it has all these different patterns it can make. I left it on “steady” for this photos, but they can blink and all sort of things. Probably cause seizures too if you look at them too long. This post made my Day! I was starting to run out of steam for decurating. I’ll plod along now. Thanks Pam. See I’m so tired I misspelled decorating!? I thought you were using a combination of decorating and curating. I think you’ve coined a new word! Good thought and Recovery! Have a wonderful Christmas. LOVE IT!!!! I need to do something like that with the grandgirl’s Barbie dream castle! I had a similar tin dollhouse in the ’50s! LOVE the little tinsel tree – we had a real tinsel tree in the 60s. sometime around 2000 my Dad took it and the light with the 4-colored wheel to a resale shop and got $30 for it. He was THRILLED – it was more than he paid for it new. I just had to bite my tongue to keep from telling him how much the resale shop guy was going to sell it for. That’s funny. Better to let him think he made a killing on the tree when it was really the resale shop that did! I love what you’ve done with the joint! The lights are the crowning touch! It’s much more fun to decorate a little tin dollhouse for Christmas…Happy Holidays and Merry Christmas to you and your family, Pam! And much quicker too. I’m STILL putzing around in my real house trying to finish up decorating. And I’ve even scaled way, way back this year! This is great Pam. Love the little lights. Super cute. Very cute, Pam! No, Santa will not be mad at you because you rescue so many things from being taken to the landfill. Santa does not like seeing gifts end up in the landfill and unloved. You save them and give them love. You are on Santa’s “Good” list! Oh. My. Gosh. 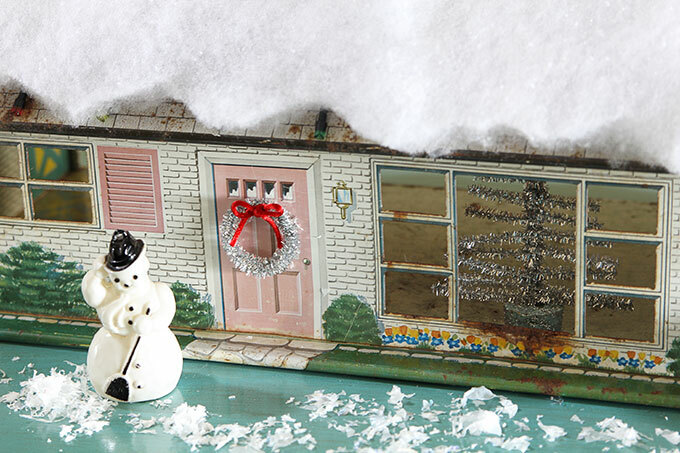 I absolutely love, love, love the Christmas dollhouse. Now I want one! They’re sort of addictive. I’ll probably give this one back to the birds in the spring, so I’ll have to keep an eye out for another one when I’m out thrifting because I’m dying to start collecting the plastic furniture for them. 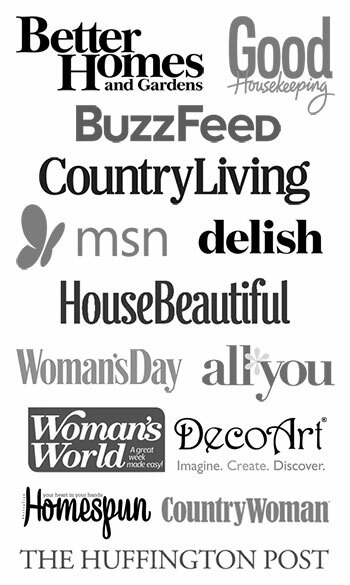 As always you brighten the day with your smart, inexpensive decorating. I found a old metal globe in Waynesville the other day. 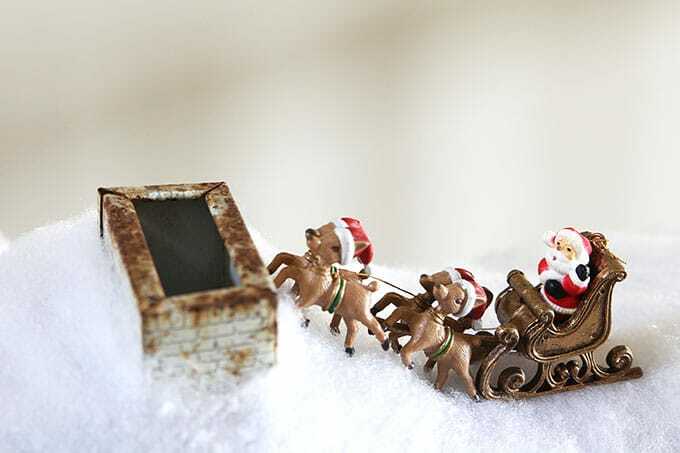 Have my old plastic sleigh and one reindeer to put on top like yours. Did find a small Santa to put in the sleigh in Waynesville too. Thanks for all the ideas. You are welcome! 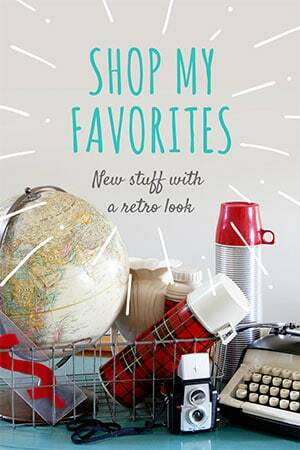 I’m so happy you were able to find some good stuff. I think I went to an outside antique fair in Waynesville a few years ago. Cute town! Your doll house is so pretty and you did a wonderful job on it. Thanks so much for sharing it with us. I really liked the dollhouse birdhouse but the Christmas dollhouse is my favorite of all the Christmas decorating I’ve seen this season. The string of lights is perfect. I’m so happy you are using the doll house for decorating. It looks so cute! I was honestly disturbed when you left it outside for those ungrateful birds. I wish I had a neat pink tin doll house. I’m getting so nostalgic for things of my youth. Thanks for the delightful image. 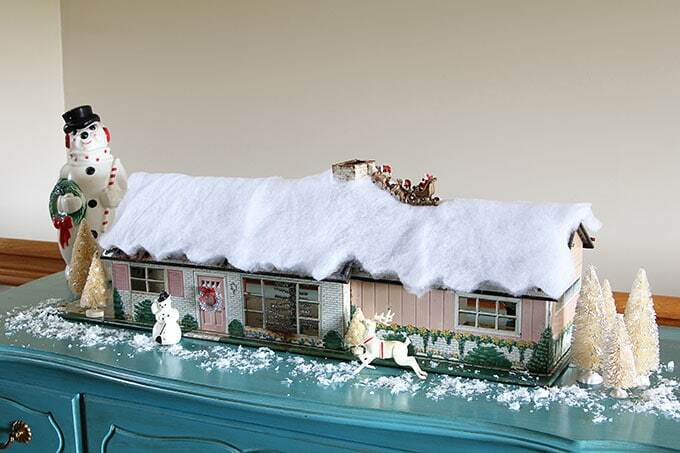 I’m all for unexpected Christmas decorations that make me smile, and your mid century modern dollhouse does just that. Love the snow, lights and especially the tinsel tree! We had one of those for a few years when I was growing up and I thought it was the most beautiful thing I ever saw. Your dollhouse has found the perfect nesting spot. Sorry birdies! That is adorable and fun! it too cold inside/outside anywhoo. 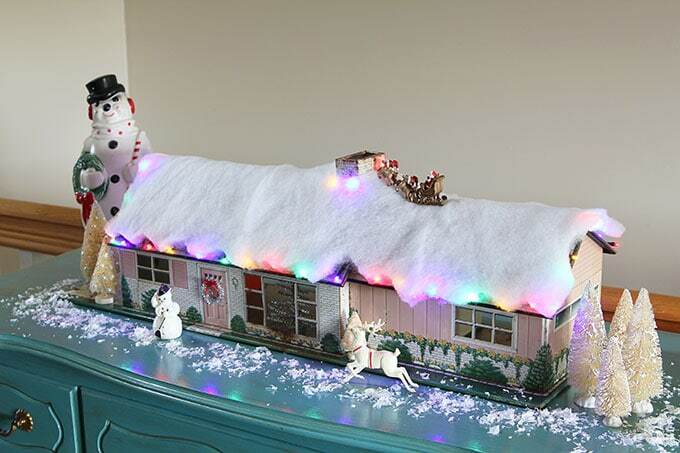 I love your little house so much, Pam…I think it is my favorite decoration I’ve seen this year! Oh, my word, this is so over the top cute!! Looks like it is straight out of the sixties. Sounds to me like the birds have no style. I need to dig mine out! Very impressive! Heehee, you’ve played with this more than the one you got as a kid…funny! You sure have it decorated nicely. Love the lights on it & Santa & reindeer on top. How is that staying up there without falling off the slanted roof? I spy that snowman in the front of the house. Got a figure just like it, only mine is red and white. It’s one of my oldest ornaments. I’m surprised the dollhouse still looks as good as it does, being that it’s been out in the weather & all. I have a metal dollhouse too. Tried to sell it, but never did b/c it would be too expensive to ship. Tried to sell it in 2 flea markets, but didn’t want to give it away. Maybe I should bring mine out & play with it like you have…LOL. Never thought of dressing it up for Christmas, but it’s a good idea. My stepdad found this same dollhouse with all the furniture in my stepsister’s garbage bin 15 years ago and brought it to me! I was 50, then, and was just as excited as a 5 year old! I kept it out for a while, then put it in my closet. Then, this year I saw one decorated like yours, Pam! I got so excited I bought some scalloped material like yours and got out other items to use for decorations, But I have MS and it had other ideas and I wasn’t able to finish decorating. But when this spell passes, I may still decorate my hearth with my little Winter house! Thanks for sharing yours! Happy New Year to Everyone!!! Yes, a winter house sounds like fun! Maybe a little ice skating rink for the front yard 🙂 Hope your MS flare up goes away quickly. And hope you have a happy and healthy year in 2017! 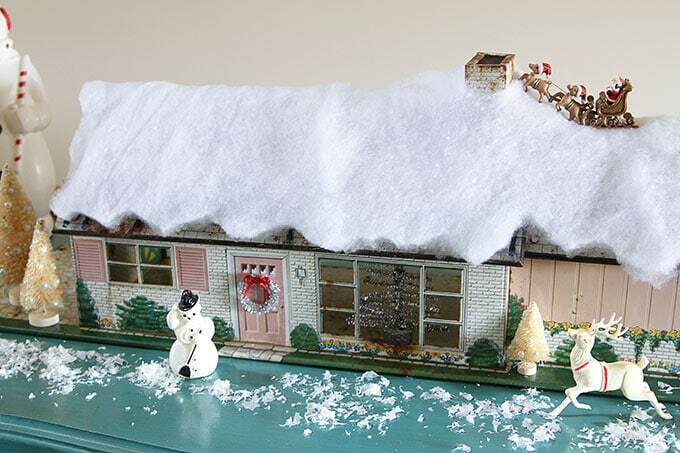 When I was a little girl(I am 61now) I lived I Alaska, I saw a snowman peeking over the roof of a house. Your tall snowman and doll house reminded me of the experience. Thank you.